Authors National Park Service career professionals Roger and Carol Shively Anderson bring their years of interpretive experience at Yellowstone to chronical the many faces of the park, it's nuances and extremes in this beautiful, lavishly illustrated book. Whether it be in the great geyser basins of Old Faithful or Norris, the Grand Canyon, Mammoth Hot Springs, the glacial valley of Lamar, or the expansive Yellowstone Lake, bounded by the ancient Absaroka range--in all, the internal forces of the earth reach the surface to reveal another page in yet another chapter in the amazing geologic story that is Yellowstone. 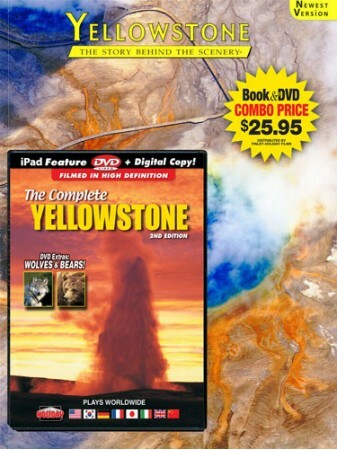 COMPLETE LOOP TOUR - Filmed in high-definition, this film is guaranteed to be the best, most complete Yellowstone DVD available with geysers, wildlife, seasons and park history. Includes great DVD Extras! ALL THE MAJOR FEATURES - Through the lens of nature photographer Russ Finley, learn about Yellowstone's scenic and geothermal features – spectacular geyser eruptions, bubbling hot pools, thundering waterfalls and more. Enjoy wildlife and their young through the seasons. Witness the dramatic Fires of 1988 and learn of fire’s effects on the forest ecosystem.